Time is tight and its Friday already. Here I finally am writing for this weekend that has similarities to my column, time is running out. It is the final weekend of the regular season in the WCHA and there are still many items to take care of. Some teams are fighting for home ice, some are jockeying for position and two teams are vying for the MacNaughton Cup. Let’s be real here and break down the conference championship to the Gophers are in the driver’s seat and Bulldogs are in the back for the ride. UMD has no lower than #2 locked up, basically no chance of gaining the #1 seed and has an outside shot at sharing the MacNaughton Cup. Let’s not diminish the #2 seed, it is a great achievement and will come in handy when the WCHA playoffs come next weekend. But between now and the playoffs, UMD has to play two games at Saint Cloud, a place that has not been kind to UMD teams over the last decade. Since the last UMD sweep at SCSU in fall of 1999, UMD is 5-14-1 at the National Hockey Center...yikes. Is it even worth breaking that streak down? Of course not, because this UMD team is a road team. This season the Bulldogs are 10-2-4 away from Duluth. This could be the year that UMD see success in Saint Cloud again or it could be a bad weekend? What happens if UMD loses or ties tonight and UMTC wins? Will UMD mail in their Saturday night effort? It is too late in the season to have a letdown if UMTC wins the cup outright after tonight. The UMD performance between their 17 game unbeaten streak and their current five game unbeaten streak, which was 3-4-1, should be reminder enough that a team cannot take anything for granted. Just look at the Packers result after coasting into the playoffs…I had to get that one in there. UMD may be second in the WCHA and SCSU is eighth, but the Huskies are getting some good goaltending. UMD continues to be the team scoring leader in the nation and 17th in scoring defense. Picks by Fiskness. Last weekend's games did not have too many surprises, but perhaps the biggest was the Badgers getting the sweep in Bemidji moving them up to ninth place. It will be interesting to see if the Badgers finally figured something out about winning on the road, or if the rigors of the season finally got to the Beavers. On all accounts the Bulldogs has played recently more like the team that was on the 17 game undefeated streak and not like the team that had been basically .500 since the streak ended. It has been encouraging to see the Travis Oleksuk grow into one of the top forwards in the league and maybe the best at winning faceoffs. His play will be a big factor in the post season for UMD. The final weekend of the regular season in the WCHA has made for some great matchups. There is still a lot at stake for most of the league. The only spot in the standings that is locked up is Anchorage for 12th place; all the other teams still have a chance to move up or down. The Bulldogs still have a chance for the league title and will basically have to win both games to get it from the Gophers. They will need to stay focused and not do any scoreboard watching during their game. If the Gophers do fall to the Badgers Friday night and the Bulldogs win in St. Cloud it will create great drama for Saturday night for the games in Minneapolis and Saint Cloud. Minnesota – Duluth at Saint Cloud State: The Bulldogs power play seems to be getting revved up at the right time helping them earn a sweep last weekend over the Tigers. The Huskies played the other Huskies and got a split last weekend. The SCSU Huskies seem to be coming together as a team and the National Sport Center is always a tough place for a road team. The Huskies still have a chance at home ice and will be pumped up for this weekend. It will be interesting to see what UMD comes to play, the team with 10-2-4 road record or the one that knows it can't be any worse than second place. I think it will be a split. Michigan Tech at Colorado College: The playoff implications for this series are huge. The Huskies are going to Colorado Springs trailing the Tigers by just one point in the standings. The Tigers are definitely slumping and looking for consistent goaltending. CC is a team that has played pretty well at home over the course of the season and the Huskies got a win last weekend which was their first win since February 4th. Is this a sign that they are back on the winning side? Ultimately I think this series will be a split as neither team is consistent enough to get a sweep. Bemidji State at Alaska – Anchorage: The Seawolves have nothing to play for except be a spoiler. The Beavers are hoping to move up in the final standings with a sweep. The Beavers have been the better team all season, but they seem to be running out of steam at the wrong time of the year. The trip to Anchorage is always tough but I don't think the Seawolves can put together back to back winning effort so I expect to see a split in the series. Wisconsin at Minnesota – Twin Cities: The Badgers had an impressive sweep of the Beavers last weekend running their road win total to three for the season. Meanwhile the Gophers also had an impressive sweep of UNO on the road as well. The Badger's can move up in the standings however they know they will be playing the first round of the playoffs on the road. But of course this is a rivalry series where you throw all records out the window. So, with Nick Bjugstad banged up and uncertain for this weekend I will pick the Gophers to earn 3 points with a win and tie thus winning the MacNaughton. Mankato State at North Dakota: The purple Mavericks are currently in 11th place and with a sweep could get as high as a tie for ninth if those ahead of them fall. The Mavericks do seem to be playing better hockey since the Calendar changed to 2012 and down the end run, also with last week off they should be rested. North Dakota split last weekend in Denver and with a split this weekend they could move up as high as third place in the final standings. With the games at the Ralph the advantage goes to North Dakota, but I think the purple Mavericks will have enough to get a split. Denver at Nebraska – Omaha: The red Mavericks are five points behind the Pioneers and tied for sixth place. 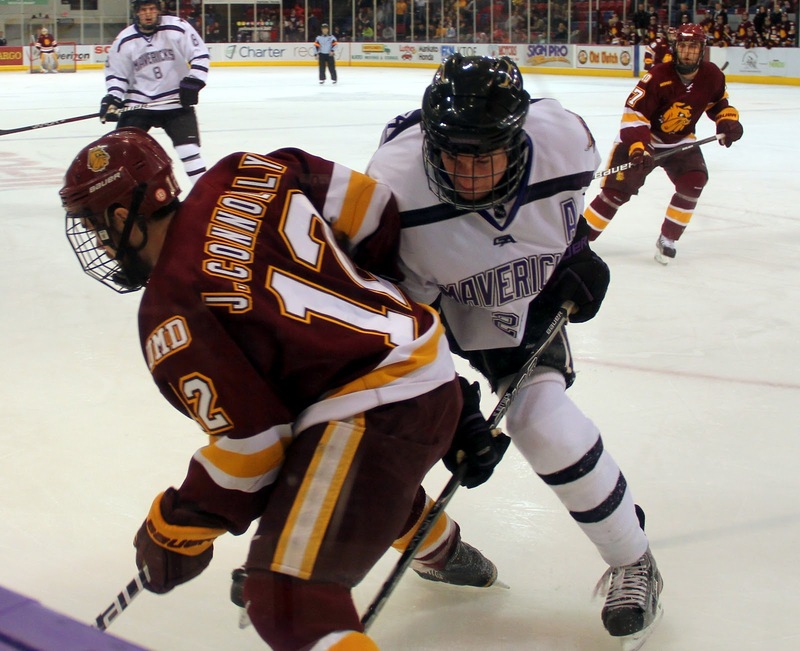 The Mavericks are coming off a very disappointing home sweep at the hands of the Gophers and are hoping to turn things around. Denver is in third place and knowing that that will remain in third even with a sweep due to tiebreakers. I think as UNO has more to play for this weekend they will be energized, but their goal tending is not steady enough to get a sweep. This will be a split.